It was not long ago that we discovered Vitra’s functional and inspiring products for homes, offices and public spaces, and we were pleased to see unique items along with some legendary concepts that marked the international furniture design. The products and concepts that the Swiss company Vitra are developing combines their engineering excellence with the creative genius of leading international designers, so the quality of the furniture items is undeniable, so here is our pick for today’s post: the remarkable Alcove sofa family created some while ago by French designers Ronan & Erwan Bouroullec. With the aim to create furniture that adapts to people, and not the other way round, Ronan & Erwan Bouroullec came out with an innovative sofa concept -the “room within a room” – that they developed it together with Vitra. 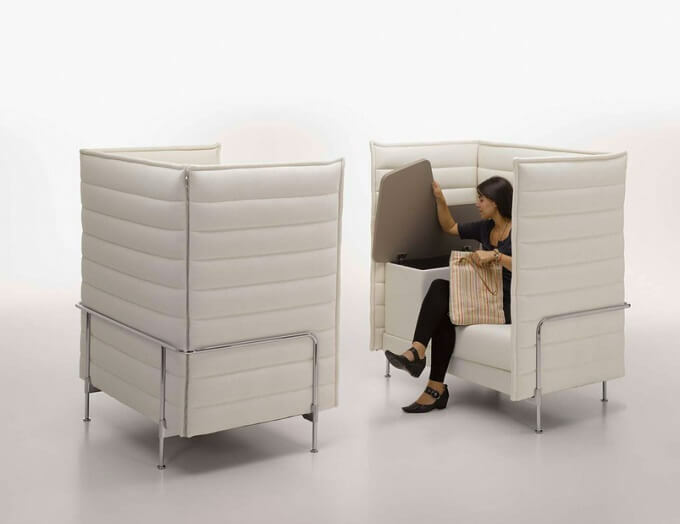 Starting from the idea that a sofa can go beyond a mere piece of furniture to become a room within a room, inside a home, designers imagined a solution that offers flexible, affordable, and comfortable space for use in home interiors as well as office environments: the Alcove Sofa. Its design was initiated by the idea o mobile, micro-architectural elements and was inspired by the Arabic “al-qubba”, being a secluded, upholstered niche, envisioned for lounging, sleeping or private meetings. Alcove Sofa is seen as an environment of its own; both a security zone and a social place with many more advantages than a standard sofa. With a modern minimalist appearance, it features comfortable seat, backrest upholstery and high, flexible side and back panels transforming it into a perfect retreat, spacious and without noise. For open-plan offices, it is the best alternative because it isn’t a permanent fixture ( can be relocated ) and is much more cost effective than making a separate partitioned meeting rooms with all the facilities they need such as lighting, air conditioning, etc.). Ideal for small meeting groups, for informal chats with your clients or brainstorming with your team, the Alcove sofa family consists of different sofa models with various trendy colors that can be easily combined to suit your needs. Below are some pictures with them. Take a look!